There are three scientific instruments on-board Swift, covering an energy range of ~0.002-150 keV, which will provide measurements of the position of the GRB. This detects the gamma-rays themselves. It is a coded-aperture instrument, with a high sensitivity and a large field of view (2 steradians), approximately the same as a (single) human eye. 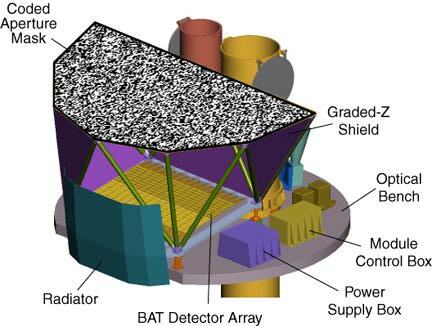 The BAT will provide an initial position of the GRB, to an accuracy of about 3-arcmin, within seconds of detecting the burst. More technical details at GSFC. Most GRBs show X-ray afterglow emission following the initial burst of gamma-rays. 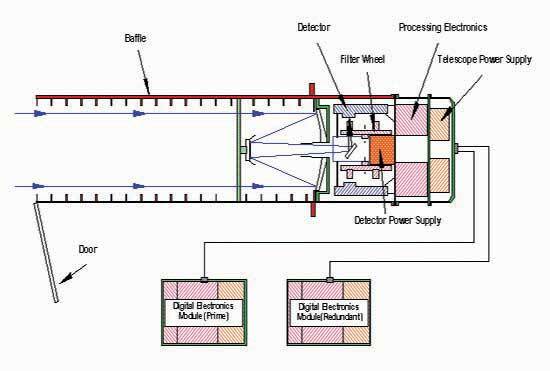 Both the XRT and the UVOT (see below) are narrow-field instruments, aligned with the BAT. After the BAT has detected the burst and localised it to approximately 4 arcmin, Swift will slew to the localised position allowing the XRT to improve on this position, typically within ten seconds, pinpointing the GRB to 5 arcsec. The actual field of view of the XRT is 23.6 arcmin square. The XRT has 3 (originally 4) operating modes, depending on the flux of the afterglow. As the emission fades, the XRT will automatically change from mode to the next; if the afterglow should become brighter again, the mode changes will reverse direction. This automatic mode-changing allows the XRT to observe over a range of more than 7 orders of magnitude in flux. 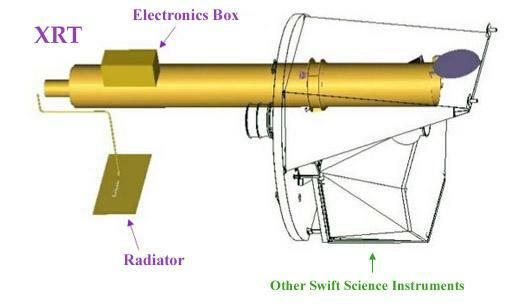 The X-ray mirrors used on Swift were the flight spares for Jet-X, which was intended to be part of the Russian Spectrum-Röntgen-Gamma mission, while the CCD detector was originally designed for the XMM-Newton MOS instruments. A description of the work done by the University of Leicester, including diagrams and photos of the XRT, can be seen here. More technical details at GSFC and PSU. Previous observations of GRBs indicate that the intensities of the optical afterglows decay quickly over time, typically as t-1.1-t-2.1. Swift's autonomous slewing capability minimises the reaction time, so allowing the rapid observation of the optical counterparts and the determination of the redshift of the object; the location of the optical afterglow should be localised to at least an accuracy of 0.3 arcsec. UV measurements cannot be made from the ground and ground-based optical observatories are at the mercy of the weather, whereas the UVOT will only be limited by the presence of bright sources in the field of view, when the filter wheel will be closed to prevent damage to the instrument. Spectral discrimination is achieved by means of a series of broadband filters and 2 grisms (one optical, one UV), mounted on a wheel in front of the detector (filter bandpass information). The field of view of the UVOT is 17 arcmin square and the image taken is recorded on a photon-counting CCD detector. More technical details at GSFC, MSSL and PSU.